While “Captain Marvel” may generally be devoid of anything that could be considered direct plot setup for “Avengers: Endgame” — aside, obviously, from introducing a character who will have a major role to play in that film — it does bring in a pretty huge change from Carol Danvers’ comic book origin story that could have major ramifications for “Endgame” and the future of the MCU. In the comics, Carol gets her Captain Marvel powers by accident, just like in the movie. But in the comics version she falls into a machine that, more or less, can bring thoughts to life. And since she was knocked into the machine during a fight between Mar-Vell and Yon-Rogg, what she was thinking about caused the machine to turn her into a Kree-human hybrid being with fantastical abilities. In the movie, Carol still gets her powers during a fight between Yon-Rogg (Jude Law) and Mar-Vell (Annette Bening), but the mechanism is totally different. Back in the ’80s, Mar-Vell disguised herself as a human scientist and was working with the Tesseract to try to build what is referred to as a “lightspeed engine.” It’s not totally clear what that means, since the Kree and everybody else already can do faster-than-light space travel, but we’ll come back to that. Also Read: 'Captain Marvel': So Where Did Carol Go for 25 Years Before 'Avengers: Endgame'? The big detail here is that this engine is powered by energy derived from the Tesseract, like those Hydra weapons in “Captain America: The First Avenger.” And so when Carol shoots the engine (to keep Yon-Rogg from possessing it) it explodes in her face, infusing her with Tesseract power, much like Scarlet Witch and Vision, whose abilities come from the Mind Stone. It’s not clear yet what exactly it means that Carol’s power comes from the Tesseract — for most of the movie her powers are limited by a piece of Kree tech on the back of her neck. Once she’s free of that device at the end of the movie we mostly just see her utilizing the standard array of Captain Marvel abilities. Mostly. At the very end of the movie, we see her do something that might be new: she herself sort of becomes the lightspeed engine and takes the refugee Skrulls — who are inside a space station — to some distant place, possibly another Galaxy. Whether or not this is one of Carol’s standard abilities depends on what exactly happened there — the ship flies off like a ship in “Star Wars” jumping to hyperspace. Is that standard MCU space flight or, as implied by the fact that she got her powers from the engine that’s supposed to be some advanced thing, a new type of space travel? Either way, traveling between star systems is not a standard Carol Danvers thing. Sure, she can fly really fast but not fast enough to cross galaxies on her own without a ship. The original Captain Marvel, Mar-Vell, in the comics did have something that would make that level of travel possible: the Nega Bands, bracelets he would wear that would allow for teleportation to pretty much anywhere he would want to go. With that being the case, the MCU version of Carol remains something of an unknown quantity because it’s tough to guess what all would be involved with her Tesseract powers. There hasn’t been a character with powers granted by the Space Stone in the MCU before, but we’ve seen both Vision and Scarlet Witch do all sorts of things that you wouldn’t necessarily assume they could do, given their powers originated from the Mind Stone. But if there’s one thing that you could naturally assume Carol could do based on what we know about the Tesseract, it’s the ability to create wormholes to travel wherever she wants. But since she only got her full powers about ten minutes before the end of “Captain Marvel,” she probably doesn’t have a full handle on what she can do by the time the movie is over. But by the time “Avengers: Endgame” rolls around? She’s probably got a better handle on things by then, judging by the mid-credits stinger, which is just a scene from “Endgame.” In that scene Carol pops up out of nowhere in the middle of Avengers HQ. Did she teleport in there? It’s tough to say. 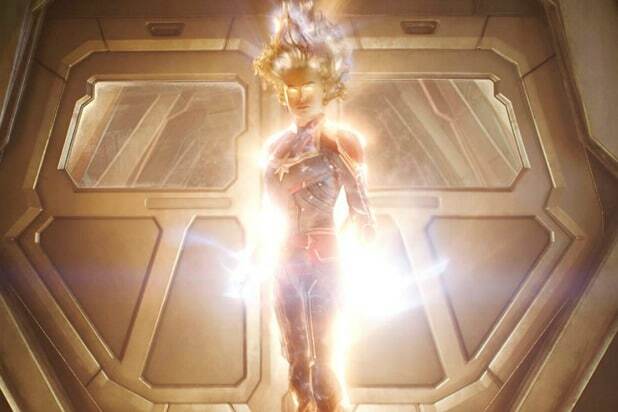 But I feel like Carol getting her powers from the Tesseract backs up, to some degree, a theory I crafted last summer in which I guessed that Carol would be given some of the powers of the superhero Quasar. Quasar is another one of these cosmic heroes, but he’s got the strange distinction of being powered by quantum energy from an alternate dimension he refers to as the Quantum Zone. Quasar also is able to travel anywhere in the universe using wormholes, but his wormholes don’t directly link to locations like those of the Space Stone in “Infinity War.” Instead, Quasar uses the Quantum Zone as a shortcut — he goes to the Quantum Zone, and then he can return to our dimension in any location he wants. Or he can just hang out in that Quantum Zone if he wants to. Or hide things there, which he occasionally does. But what feels most relevant to Quasar’s abilities is that in the MCU we have the Quantum Realm, which is poised to play an important part in “Avengers: Endgame.” And it would be very useful if Carol’s Tesseract-infused abilities allowed her to travel at while not just anywhere in the normal universe, but also to the Quantum Realm. The Tesseract being involved in her powers provides an easy way to grant her such an ability. Or maybe I’m way off on this. But if there’s anything here I feel extremely confident about, it’s that it’s hugely significant to the plot of “Endgame” that Carol got her powers from the Tesseract in this version of her origin. Since the MCU loves to take massive liberties in bringing the comics to the big screen, there’s no way to know specifically what it means until the moment we know. ‘Captain Marvel': So Where Did Carol Go for 25 Years Before ‘Avengers: Endgame’?